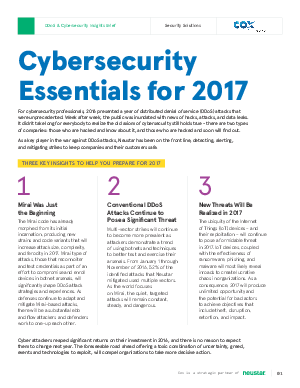 For cybersecurity professionals, 2016 presented a year of distributed denial of service (DDoS) attacks that were unprecedented. Week after week, the public was inundated with news of hacks, attacks, and data leaks. It didn’t take long for everybody to realize the old axiom of cybersecurity still holds true - there are two types of companies: those who are hacked and know about it, and those who are hacked and soon will find out. As a key player in the war against DDoS attacks, Neustar has been on the front line, detecting, alerting, and mitigating strikes to keep companies and their customers safe.